The Euromaidan protesters in Kiev who ousted former president Viktor Yanukovich sought an end to the corruption, selective justice and crony capitalism that had plagued the country since the fall of the Soviet Union. How ironic, then, that the man who will likely be elected president of Ukraine this Sunday is a leading representative of this old way of doing things. Petro Poroshenko is an oligarch who has shifted political allegiances—even serving in the Yanukovich government—and exploited political ties for commercial gain. But whereas most of Ukraine’s oligarchs preferred to stay out of the political crisis as long as possible, at least publicly, Poroshenko clearly threw his weight behind the Euromaidan movement. The fact that Russia has banned the products of his Roshen candy company—which gives him his nickname, “The Chocolate King”—and recently seized a Roshen factory in Lipetsk seemed to cement his credibility among voters. If he wins, huge expectations will be vested in him: hopes that he can solve the crisis in eastern breakaway regions, set up a working relationship with both Russia and the West, and implement reforms called for by the Euromaidan movement. But based on his background and his campaign, Poroshenko seems destined to disappoint. Memories spring to mind of former President Viktor Yuschenko, another pro-Western candidate who was also ushered into power by the Orange Revolution in 2005—only to be booted out in elections five years later, having received an abysmal 5.5 percent of the vote. 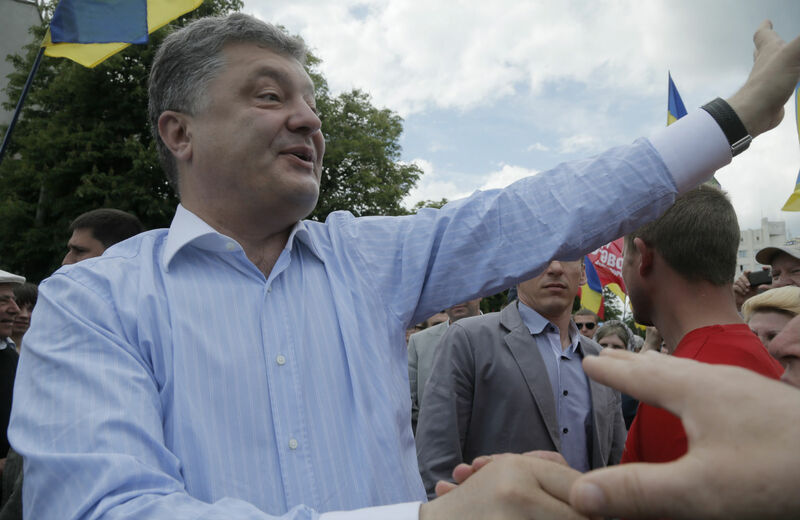 According to a poll conducted earlier this month by the Kiev International Institute of Sociology, about 34 percent of Ukrainians are ready to vote for Poroshenko. More importantly, 54.7 percent of eligible voters who had already decided on a candidate said they would cast ballots for Poroshenko, putting him over the 50 percent threshold he needs to avoid a second-round runoff. His nearest challenger, Yulia Tymoshenko, the former prime minister who was released from prison in February after being jailed under Yanukovich, had the support of only 9.6 percent of decided voters. But her Batkivshchyna political party controls Parliament, and acting prime minister Arseniy Yatseniuk is a member and close ally of hers. Banking tycoon Serhiy Tigipko, who is generally pro-Russian, had the backing of 6.7 percent of decided voters. The fact that all three leading candidates are wealthy businesspeople—even long-time politician Tymoshenko was first known as the “Gas Princess” for her lucrative business in natural gas imports—lends credence to arguments that while the Euromaidan movement changed the regime in Kiev, it hasn’t posed a threat to the crony capitalism that flourished under Yanukovich and his predecessors. According to Volodymyr Ishchenko, director of the Center for Society Research in Kiev and an editor of the Ukrainian progressive publication Commons: Journal for Social Criticism, Tymoshenko’s support has likely been eroded by the widespread desire to avoid a runoff in three weeks’ time. While his campaign platform makes promises to decentralize power and conduct an “anticorruption lustration” of the judicial, law enforcement, tax and customs agencies, it’s filled mostly with vague promises. Yet if he wins, a huge number of critical problems will face him. The first is one of national stability. Pro-Russian rebels have seized dozens of towns in the east, declared independence from Kiev and announced they won’t recognize Sunday’s election. Ballot boxes have been seized, and it’s likely that many voting stations in Donetsk and Luhansk regions won’t be able to open. This election, according to Ukrainian, Western and Russian leaders, is supposed to bring legitimacy to the new government, which Russia has refused to recognize. But electoral commission head Oleksandr Chernenko recently estimated that 5 to 7 percent of Ukraine’s 35 million eligible voters may not be able to cast ballots. Even though the majority of citizens haven’t taken up arms in Donetsk and Luhansk regions, most still view the new government in Kiev with extreme distrust. With a turnout of only 20 to 40 percent expected there (compared to 60 to 80 percent in the center and west), will the new president be able to bring these regions back into the fold? Despite his promise that his first trip as president will be to rebel-held Donetsk, Poroshenko hardly seems the man for the job. According to Kiev International Institute of Sociology polling, he has only 6 percent support in the Donetsk and Luhansk regions (and only 17 percent in the neighboring Kharkiv region). Moreover, Poroshenko owns the major television station Channel Five, which has led the Ukrainian side of the propaganda war with Russian media. Channel Five in particular is widely hated in the east for vilifying Donetsk and Luhansk residents as “separatists” and “terrorists,” yet it is the one asset which Poroshenko has pledged to keep if he wins. Another task facing Ukraine’s new president will be smoothing over the hostile relationship with its larger eastern neighbor. Poroshenko has pledged to “normalize” relations with Russia within three months of taking office, and some even hope that he will be able to pursue a “Finlandization” policy of non-alignment. While his outspoken support for European integration seems to rule out complete neutrality, Poroshenko has, in apparent deference to popular opinion, said he won’t seek to join NATO. Yet even last summer, before the Ukraine crisis, Russia banned Poroshenko’s Roshen candies, and this year it seized his factory there. Although he’s against NATO membership, Poroshenko has promised to sign the economic half of a European association agreement as soon as possible. (The political half was signed in March.) This would seem to be his response to the third major problem the new president faces: Ukraine’s plummeting economy. According to the International Monetary Fund, the economy is expected to contract 5 percent in 2014, and the hryvnia has dropped another 3 percent just this month. The conditions on the IMF’s own bailout deal demands cuts to subsidies and social services and a floating exchange rate that will sink purchasing power even further, likely resulting in a rise in poverty. According to Vasily Koltashov, an economist at the Institute of Globalization and Social Movements in Moscow, under the association agreement, European products will flood the Ukrainian market, killing most local industries besides metallurgy. Although tough new regulations under the IMF loan and EU deal are supposed to root out corruption in the country, no prominent Ukrainian politician has made a central issue of tax loopholes. “Ukraine is losing more money due to tax evasion, due to capital flight to offshore [tax havens], than to corruption,” Ishchenko said. Will Poroshenko be the president who is finally able to force oligarchs to keep their money in the country? Will he be able to stop them from fleecing the state? Given his personal history, it seems unlikely. Poroshenko has been faced by corruption allegations in the past, and was forced to resign as head of the security council under Yushchenko amid a corruption scandal also involving Tymoshenko. Moreover, he has close ties with the oligarch Dmytro Firtash, who reportedly brokered the deal that saw opposition leader Vitaly Klitschko withdraw from the presidential race and throw his Udar party behind Poroshenko. Firtash faces bribery charges in the United States and was recently arrested and released on bail by the FBI. Ishchenko said he has zero hope Poroshenko will challenge the crony capitalism that has come to rule Ukraine, and predicted the problem will only get worse under the association agreement. The discourse about the separation of big business and the state that was highly prevalent during the Orange Revolution and the Euromaidan protests has now largely disappeared, Ishchenko said.